You can create a single Fruit Intake Booking for each block from which you expect to receive fruit. Ideally these should be created ahead of time as part of your general vintage planning. A Booking groups related parcels of fruit together and can be used across multiple deliveries. For example, if you are expecting to receive fruit in more than one delivery from the same block, you would use the same Booking for each delivery. If you are expecting deliveries from more than one block, you would create a Booking for each. If you are expecting deliveries from the same block over several days, you can create a separate Booking for each. There’s no hard and fast rule in this regard but be aware that you can enter the number of loads expected for a single block for a single day. If you are looking to enter fruit into the system without a booking you can use the "Unplanned Arrival /Receive Fruit" option detailed here. This console has a number of filter controls at the top that determine the bookings displayed on screen. Note: If you have set a default vintage in your Winery Setup – Defaults, it will already be shown in the Vintage field. The columns can be configured by clicking the spanner icon (marked below) and editing the view profile. This menu also contains Organiser mode which allows you to customise default booking timeslots and standard working hours for the winery to make it easier to schedule multiple bookings over the course of a day. Clicking the pink heart icon will remember the Organiser settings for next time. By default, all bookings for the current day and current vintage are displayed. You have several options for broader date ranges or to isolate specific bookings based on such fields as Grower, Varietal and Region etc. Booking Number – you can have an auto-generated booking number produced by the system and provided to your growers as a reference. To help streamline the intake of fruit we recommend that your growers provide this reference on the consignment note for the fruit in assist your staff in finding it in the system quickly. Alternatively, you can enter this number manually. To setup a custom format for you code please see Using Auto-codes. This allows you to record quality information about the fruit and any additional notes you require. Click Now+Save to save the booking. Upon saving the new booking a booking receipt will print that is designed to be sent to the grower or owner of the fruit. It has all the details about the booking. 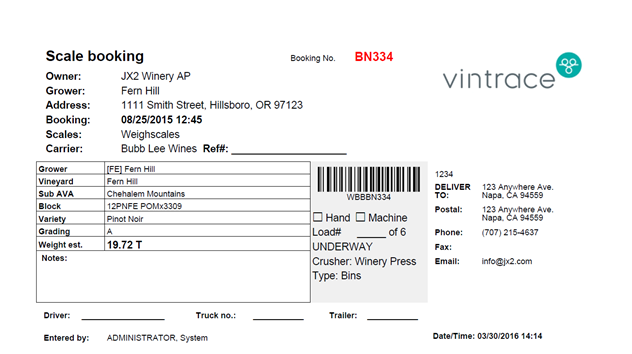 We advise that you ask the grower to ensure a copy of the booking receipt arrives back at your winery with the fruit. The barcode on the receipt can be scanned at the scale to quickly locate the booking in the system. There are are 2 main options when it comes to recording the intake of fruit into the winery. In the event you receive a load of fruit at the scale with no prior booking it is not necessary for you to create one. From the Fruit intake console you can click New – Unplanned Arrival and enter the delivery in one simple step. Receive Fruit from a booking. Once you have entered bookings into the system, clicking the "Arrive" button on the right hand side of the fruit intake console. The Intake Details window is used to submit the details for each unique load of fruit brought in as a delivery to your scales. Last Load – Check this if it is the last lot of fruit for the booking, this will update the booking status to completed upon save. If you weigh individual bins to calculate a total gross and tare weight then you can enter bin information on this tab. Click the Add line button to add new entries to the table. The Update button will recalculate the total weight on the Fruit tab and the Verify option ensures all mandatory fields are set – it will alert you by highlighting fields in pink if anything is missing. The Quick Load button allows you to quickly add a number of line items so that you don’t have to click the Add line button for each. This function is particularly useful if you have only a handful of standard-sized fruit bins configured in vintrace and don’t have them all uniquely numbered/labeled; i.e., it allows you to use the one bin type by entering the gross/nett (net) weight as required. Bin to use ­– Bins should already be configured in the system or may be added by clicking the new button. Upon bin selection any tare weight set on that bin will automatically drop into the tare weight on the weight screen. Crush/Press load – If using this feature you can designate particular bins of fruit to a specific crush/press load. This will help to ensure, when crushing/pressing fruit from different blocks, the specific bins make it into the right load. MOG – the level of Material Other than Grape – there is no standard for this; you may set your own. Cost Details – the rate paid per tonne / ton for the fruit and freight. Can be entered as a total amount or as a rate per tonne / kg / ton / pound. Photos can be added under the Photos tab of the Intake details window when processing a delivery. More than one photo can be added and then subsequently viewed by opening the intake details once the delivery is saved. The most common use is for quality control/MOG validation. If this feature is enabled then this tab will be available upon an arrival to confirm the designation of bins or total weight received at the scales for the nominated Crush/Press load. If weighing individual bins then this section will be filled out automatically for you. If you’re entering a total gross/tare/nett (net) weight then you can simply click the All fruit option in this window to copy that across or manually specify the weight designated for a particular load. Scales – specify the scales the fruit is being weighed at. Weighmaster – Name or Details of the certified weigh authority where applicable (Can have a default set at Winery Setup – Workflow – Defaults). This is most generally used if 3rd-party certified scales are being used. Truck loads – click the Add load button to add a load of fruit delivered by this truck. You can select other loads and edit or remove them from the delivery. If you have a 3rd-party weigh tag, a pick map, a grower’s field tag, etc., that you want saved with this fruit intake, you may save a scanned file, browse to it and upload it. This option allows you to enter the arrival information either as it happens or after the fact if you find yourself catching up on paperwork at the end of the day. You will require all weights and details about the delivery before commencing (including any 3rd-party weigh tags). From the Fruit Intake Console select the booking and then click Arrival. The Intake Details and Delivery form will appear and require all mandatory information to be completed. Upon clicking OK you will be able to click Save to complete the operation. Option (2) Schedule ahead of time and prepare a work order for the delivery. Please note: this mode needs to be enabled by us so please contact vintrace support at support@vintrace.com to request this feature. 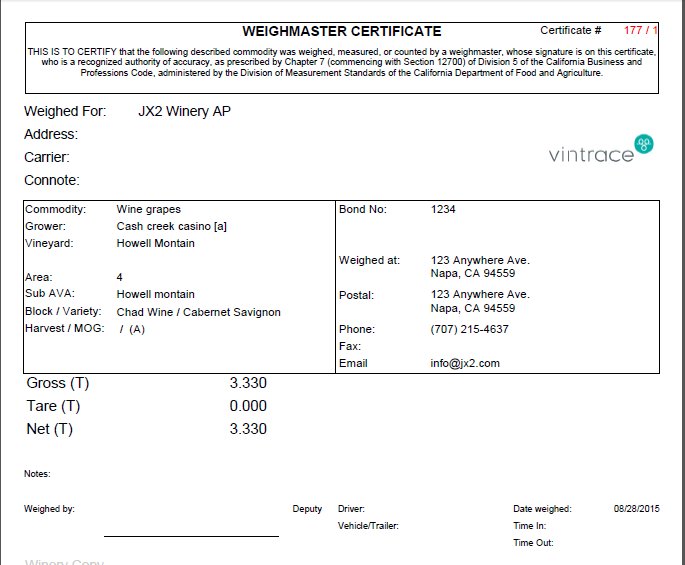 Labeled “Weighmaster Certificate”, the docket contains details about the owner, carrier and grower of the fruit as well as a comprehensive breakdown of the weight. If bins are used in the intake, then the gross/tare of each bin will be printed. If fruit sample readings were taken on delivery, they will be displayed. A note about the Docket No. The docket sequence is represented as a Unique delivery number / Sequence of the intake. The delivery number will increment for each new delivery of fruit and the load sequence number will only increment – per delivery – if there is more than one load (fruit from a different fruit source) on the truck. For example, a truck arrives with fruit from two different growers. Each load of fruit from a different source should be entered as a separate load on the delivery (see here). The first load will have the docket number of 1/1 and the second will be 1/2. The next truck has fruit from the one grower. The docket number for that load will be 2/1 and so on. To re-print a docket for a completed delivery, select the booking from within the Booking Console and click Print docket. If there are multiple deliveries for this Booking the system will prompt you to select from a list. You may prepare a crush note from the Booking Console by first selecting the appropriate Booking and then clicking Crush/Press. 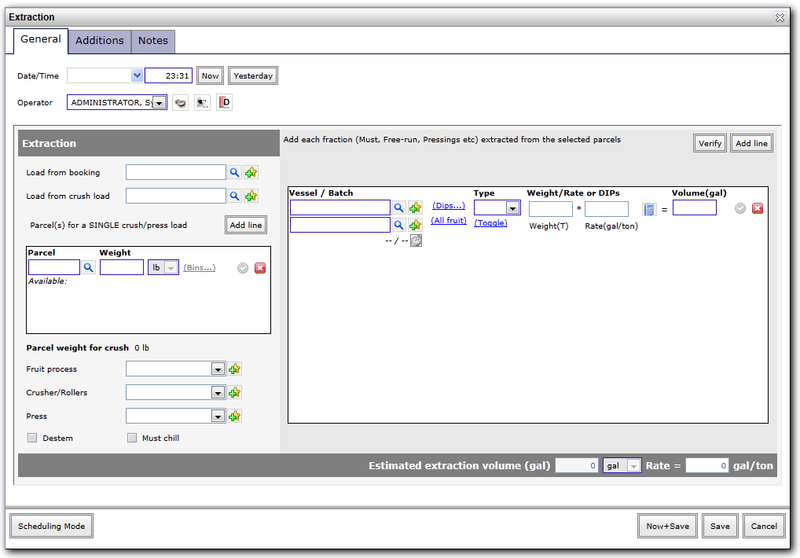 The Extraction window will be pre-populated with the Booking or the Crush/Press load if you have that feature enabled. Click Add work order or Now+Save to open new Work Order Writer and print it.